Catalog Home > 1886PLC-6 6 Position Complete Listening Ctr. 1886PLC-6 6 Position Complete Listening Ctr. The Spirit SD supports many different formats: AM/FM cassette, CD player and even USB & SD ports (1886 only). The Spirit has proven itself in the classroom and can be used for ELL/ELD language acquisition activities and foreign language instruction in addition to literacy applications. 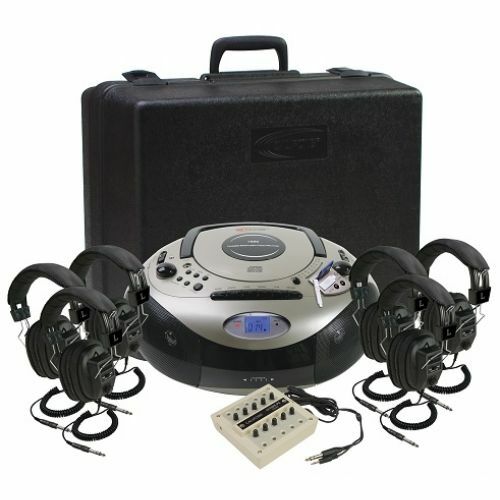 A built-in microphone records student responses and helps teachers monitor student progress.6 Six person Spirit SD Learning Center (includes foam-lined storage case, 1210AVPS jackbox, six 3068AV headphones). Spirit Learning Centers are expandable up to 10 students with the included 1210AVPS jackbox.